exporelax eventbock is the perfect seating-possibility at events. 3 pcs of regular EURO-pallets are building the basic construction. on top of these pallets there is a foam-cushion and over all this you just put a printed cover to hide the pallets. Not only hiding the pallets – this is a perfect advertisement area as well and an eyecatching ad-value for each event. 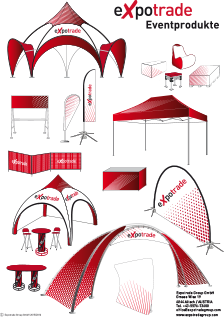 expotent foldable tents perfect for the Rally-season are you already prepared for the winter-season ?